Activision brought a playable Marvel Ultimate Alliance 2 to its Comic-Con get together this week, giving us our first hands-on opportunity with the sequel, which has changed developers from Raven Software to Vicarious Visions. 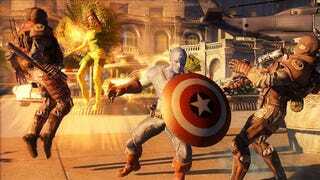 While the gameplay is largely similar to the first, putting the player in control of up to four Marvel super heroes, the visual style has drastically improved from the first Marvel Ultimate Alliance. MUA2 looks incredibly sharp, taking better advantage of the now-gen hardware than the original. Also new is the "fusion" combination of powers, letting characters like the Hulk and Wolverine work together—in the Marvel trademark "fastball special"—to take down enemies. Other characters can combine in less predictable ways, with the Hulk joining Songbird to create an amusing hamster ball-like sphere of pink and green destruction. Hulk roll!! Normal attacks and special attacks are nearly identical to the first Marvel Ultimate Alliance, using the right trigger to perform each hero's signature moves. Our run through of the demo, set in Washington, DC and during the Civil War storyline that ran through numerous Marvel titles in 2006, was a relatively quick beat 'em up affair. We had access to two sets of teams that included mainstays like Hulk, Spider-Man, Storm and Iron Man. We met up with fan favorite Deadpool, who was no easy task to defeat. Fortunately, after putting a hurt on Deadpool, he asked to join our team of Marvel's merry men. The writing here was spot on, with the anti-hero spouting laugh out loud dialog. We were given three options with which to respond to Deadpool's request and choosing one affected how our team leveled up, making us either more defensive, aggressive or diplomatic. Those choices affect a team's defense, strength and fusion powers, respectively, adding a bit more variety to your alliance of choice. Marvel Ultimate Alliance 2 looks like it will go a long way to improving the series, with noticeable boosts to the game's graphical capabilities, leveling mechanics and storytelling. If you were just a casual fan of the first, we'd highly recommend paying attention to the second.